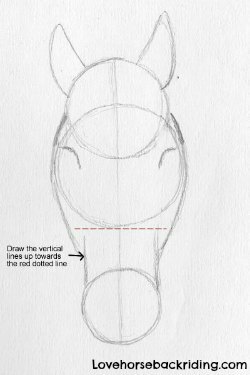 You should now be on step two of the head in this drawing of a horse if you've been following this how-to tutorial. If you just popped in, click below to go back to the beginning and get started on the horse head sketch process. You'll end up here again after getting up to speed in no time. (i) Start by drawing two vertical lines coming up off your bottom circle towards the red dotted line. This will shape the bottom part of the horses's face. The geometrical figures and lines you already drew and this picture will guide you. If you need to make your own dotted line you can do so, just keep it light so you can erase it after you get your vertical ones done. (i) Continue by drawing two curved lines from the middle of the top circle going around the outside of the larger circle, ending at the two vertical lines above the nose. 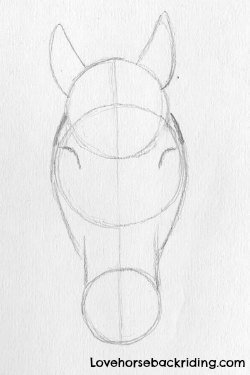 You should be able to see now how that defines the span of the front of the head in your drawing and leaves it ready for perfect eye placement. To do this, you will use a downward facing curve. Start the top of the eye just to the inside where the outside face line you just drew and the bigger middle circle intersect. If everything looks alright to you, you're now ready to move on to more outlining and details. If not, you can review this page again or go back if you need to adjust your original shapes. 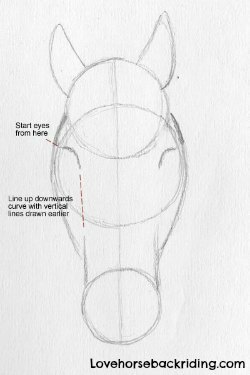 Leave this drawing of a horse face tutorial to go back home where you will discover more about riding and training your faithful steed.